The Penguins' five-game road trip got off to a good start on Saturday night with a 4-1 win over Toronto in front of an Air Canada Centre packed to 104.1% of capacity. It was just the second Penguins win in their last eight games. Sergei Gonchar led the Pens with two goals and an assist, and Marc-Andre Fleury stopped 42 of 43 Maple Leafs shots to pick up the victory. It was a nice bounce-back game for Fleury, who was chased from his crease after giving up four goals on 15 shots to the Flyers on Thursday night. Bill Guerin and Sidney Crosby also scored for the defending champs. Crosby would also hit the 450-point milestone for his career during this contest. The game was highlighted by a bizarre sequence in which a Toronto penalty shot was wiped out due to a reviewed Gonchar goal, which subsequently rolled back the clock and turned the penalty shot into merely a penalty (two goals cannot be scored on one play). Simple enough. Or not. To make things even more confusing, Gonchar would score his second goal shortly after leaving the penalty box. 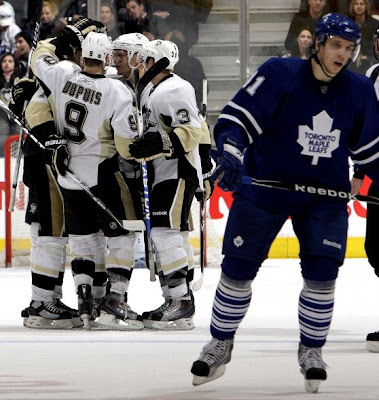 Hopefully, the victory will not be too costly for the Pens. Defenseman Brooks Orpik left midway through the game with an undisclosed injury and did not return. The Pens resume their road trip on Monday at 22-20-3 Minnesota. The puck drops at 8 PM, and the game will be televised on Versus. -Crosby didn't just "also score." That goal was unreal. -The Gonch goal-non-penatly shot was weird but the rule is that if a goal is scored which isn't called (until after a review during a stop in play) and a penalty is called between the time the goal is scored and the stop, the penatly still stands. I know, it's stupid and doesn't make any sense. This is one of those paradoxical situations that sometimes arise in sports. -As much attention as Sid and Geno get (deservedly so), it's now painfully obvious that this team cannot win without Gonch in the lineup. Period. No one QB's the transition game better. -Speaking of Geno, SHOOT. You're two scoreless games away from seeing your ugly Russian mug on the back of a milk carton. -This game was the Saturday "Hockey Night in Canada" game. I hope all of Canada enjoyed watching Gonch light the back of the lamp. Should probably get used to seeing that come February. It's looking like the Pens might be dealing Letang before the trade deadline. It'd be a shame but this just proves how valuable Gonchar is to the team in the present and short future, even though Letang could be a big factor in it's long term future. The reality is, they can't afford them both, they still need a top winger and Gonchar is currently the better player. Letang could bring the Pens a nice addition to the wing in a trade, at least as much, or more than Whitney brought.